One girl from the first arc is actually getting the spotlight this time. She may have little relevance from the beginning, it’s notable to see her background bit by bit. But before that, Camille, the real name of the deadpan one, has a mission to follow according to the member of the organization. As the show explains it, people like her are not normal humans. Boogiepop can just casually appear without changing to its signature outfit. Most of the episode is focused on Suema, the close friend of Miyashita. She analyzed the painting created by Asukai and she felt uneasy looking at it. 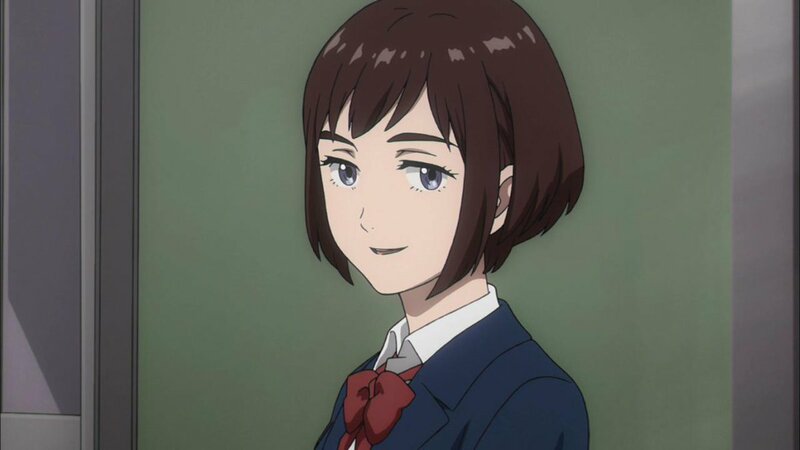 The one thing she didn’t notice is her close friend being possessed by Boogiepop for a short time. If you listen closely, you can tell the two character apart from the voice alone. Props to Aoi Yuuki for a great performance. Plot wise, we’re already getting somewhere now. The conversation between Suema and another girl gives a better understanding of Asukai’s actions. As he is controlled by the Imaginator, he always needs two people to fully create the incomplete roses he’s been seeing. In other words, he gets a part of the missing rose of one person then pieces it together from another one, in turn it shows what his purpose is. I still don’t know what he’s going to do with the completed roses he created. All I know is that something ominous is incoming. Suema also ran into Camille as she was about to commit suicide. She gave her encouragement to keep on living except she doesn’t know Camille’s true identity. Maybe it’s an ability by the non-humans to blend into society. She also did mention that she’ll fight against Boogiepop one day. If you can understand what I’m saying so far, at least you’re willing to keep up with it.